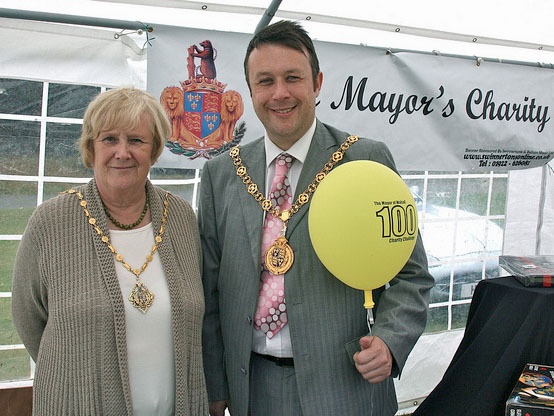 Final countdown for Mayor’s Challenge 100 | The Bloxwich Telegraph – incorporating The Bloxidge Tallygraph and Walsall North News. Founded 2006. Walsall’s Mayor is asking people for a final push towards his novel fundraiser – with just ten more registrations needed for his Challenge 100 initiative. Councillor Garry Perry appealed for 100 businesses, groups or individuals to pledge £100 in 100 days to bring in £10,000 for his Charity Appeal. And with the finishing line in sight this Sunday, he is hoping that the final ten needed for his target 100 will come forward. The Mayor said: “The response so far has been out of this world with people doing all sorts of things in the name of my three chosen charities. “We’ve had an 80’s night, an open garden event, sponsored head shaves, cake sales, dances and bike rides, a dog wash, raffles and donations – the list is endless. “I am so grateful for everyone who has played a vital role in Challenge 100. “I just hope we can meet our target by this Sunday’s closing date and am making this appeal for another ten groups or individuals to get on board. The Creating Chances Trust is a partnership between the four Black Country authorities and has been set up to support the education and training of children in care and leaving care. The Swing improves the futures of bereaved children and young people and was established by Walsall Bereavement Support Service. PROUD is a parent-led Down’s Syndrome support group that encourages individuals with this condition to lead full and rewarding lives and raises awareness. To take part in Challenge 100 complete the eform at www.walsall.gov.uk/index/council_and_democracy/mayor_of_walsall/challenge_100, contact Jo Whitehouse at whitehousej@walsall.gov.uk, or contact the Mayor’s Office on 01922 652072. Those who register for Challenge 100 will be invited to a special reception in Walsall Town Hall and the top three fundraisers which bring in the highest amount will be treated to a special visit at their home, school or place of work by the Mayor.